Common Mistakes: Palin - Lieberman Switcheroo? 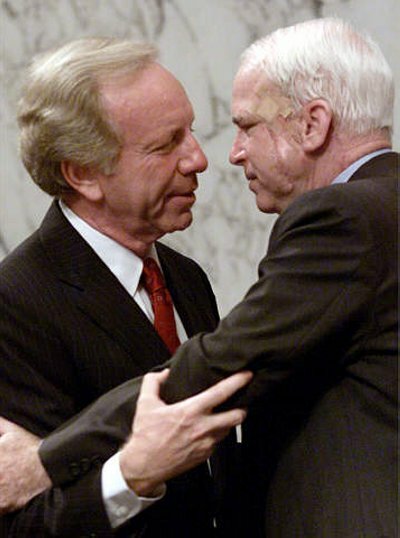 Is the Palin nomination all a huge ploy by the McCain camp to pull a switcheroo and replace her with Lieberman after the convention? Reading this NY Times article makes me think it's possible. Conservatives promised a floor fight at the convention if McCain picked Lieberman or Ridge, his two favorites. By picking Palin for the convention, McCain gets to test how she will be received and avoid a floor fight. He gets an energetic and enthused convention while finding out how she does in the press. But the public reception isn't going so well. So after the convention, McCain can justifiably have her bow out (I imagine she might say something like, "for the sake of my family, I feel I should decline the Vice Presidency" - it seems Republicans are already setting her up for this scenario.) Then, the convention would be over, McCain announces Lieberman or Ridge and avoids a floor fight. Could this have been McCain's plan all along? UPDATE: The problem for this plan now is, the more people who know Palin come out of the wordwork to explain how scandalous she is, the more the hard-right conservatives are coming to her defense. So if McCain lets her go, he'll create a firestorm. He may be stuck with her now, come hell or high water. it's funny you say that. My husband said this exact same thing. Only that this is going to backfire because he didn't realize just how much baggage and weird scenerios this person has on them. Why is no one talking about the circumstances of when she was in labor. Being in Tx whenn her labor broke, then gave a thirty minute speech because she "had to deliver her speech", trecking on and taking a commercial flight and layover in Seattle, then to Alaska. Arriving in Alaska and driving 45 additional minutes to Wasilla's hospital is a POOR judgement dangerous to both her and her unborn handicapped child and shows her real ambition. Leaving family morals behind and using the child as a way to get sympathy from the evangelical group because she supposedly didn't abort it... but yet she pulled her daughter Bristol out of school for FIVE months with MONO... which at worst lasts ten days... Tell me this isn't fishy and again if it is true.. what is her judgement?